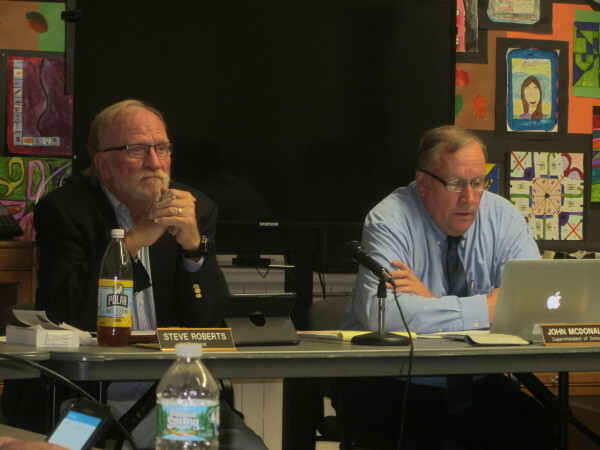 Regional School Unit 13 Superintendent John McDonald (right) unveils his Schools of the Future plan on Thursday night as school board Chairman Steve Roberts listens. ROCKLAND, Maine — The Rockland-area superintendent on Thursday evening unveiled a dramatic overhaul of the school district that calls for a single high school, a single middle school and the closure of three school buildings. The major points of the Schools of the Future plan proposed by Superintendent John McDonald include a single high school for grades nine through 12 at Oceanside East in Rockland and a single middle school for grades six through eight at the Oceanside West building in Thomaston. The district has used two high schools — housing grades 10 through 12 in Rockland and eight and nine in Thomaston — since 2011. The district also has maintained two middle schools — Rockland District Middle School and Thomaston Grammar School — since 2011. Slated for closure are the Gilford Butler School in South Thomaston, which serves kindergarten through second grade; the Lura Libby School in Thomaston, which serves kindergarten through fourth grade; and the McLain School in Rockland, which houses administrative offices and alternative education programs. To accomplish these changes, both Oceanside East and Oceanside West would require renovations. Owls Head Central School would be subject to a major expansion and renovations also would be needed at the Thomaston Grammar School and the Cushing Community School. As part of the plan, elementary schools would serve pre-kindergarten through fifth-grade students at the South School in Rockland, with a projected enrollment of 363; Owls Head Central, with a projected enrollment of 206; Thomaston Grammar, with an enrollment of 210; and Cushing Community, which would serve 87 students. The superintendent, business manager, special education and adult education offices would be housed in the South School, although the administrative office relocation would be delayed until the fall of 2017. The RSU 13 board will meet to discuss the proposals at a meeting on Thursday, Oct. 15. There will be community forums for the public through the end of October. The board will vote on the plan at its Nov. 5 meeting. Renovation and expansion costs are estimated at $13 million. Business Manager Peter Orne said, however, that the district won’t need to borrow any money because energy and operational savings from the changes are projected at $770,000 annually and would more than offset costs of the work. In addition to building changes, the Schools of the Future plan calls for curriculum changes. Having one high school, one middle school and several pre-kindergarten through fifth grade schools would provide for a unified, coordinated curriculum, the superintendent said. — The addition of world languages at all elementary schools in the district beginning next year. — A freshmen academy to help first-year high schools make the transition to high school. — Expanded opportunity for high school students to earn low-cost or no-cost college credits. — The creation of a science, technology, engineering and mathematics academy and a liberal arts academy coordinated with local businesses and organizations. — Work with the Restorative Justice program for a school culture that would include progressive development. Any school closure would need the support of local residents. If the board votes to close a school, residents could vote in a referendum to overturn that decision, but any additional cost to the district to keep a school open would be borne solely by that municipality. If a building is closed, the ownership reverts to the town or city.